3rd Generation Antiques combines gemological and jewelry expertise with generations of market experience to meet each specific need. In addition to having many decades of experience, our chosen craftsmen possess an educated passion for the artistry and history of master jewelry making techniques. We offer several options for attaining the highest competitive prices for the sale of your diamonds, gems and jewelry, including buying from you directly, or consignment sales. Certified jewelry appraisals by graduate gemologist Frank Bartle Jr. Restoring your pieces to optimal condition ensures you of attaining maximum value. We offer 28 years of professional experience and expertise in jewelry, crystal and glass restoration. The restoration of antique and estate jewelry requires a thorough knowledge of earlier hand fabrication and manufacturing techniques. We offer a variety of appraisals to meet each specific need including insurance replacement, fair market value and resale value. 3rd Generation Antique's expertise in the evaluation of diamonds and estate jewelry is unprecedented. Is your Jewelry Safe? Home Burglaries Are On The Rise. - Home visit to digitally record valuable with inventory and appraisals. - Includes original copy and scanned documents on digital media. - Certified Appraisals for Contents Insurance. By far, the most important is for insurance purposes. Over the years, the value of your jewelry and gemstones can fluctuate greatly. If your last appraisal is over 3 years old it may be out-of-date and, as a result, your jewelry could be appraised for less then its replacement value. 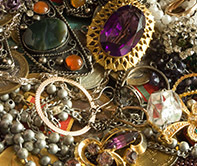 That means you risk a substantial financial loss if your jewelry is lost, stolen or damaged. For your protection, it is recommended you have your jewelry appraised every two years. Frank Bartle Jr. will provide you with accurate appraisal reports based on current market values so you can obtain adequate insurance coverage. You may also want to determine the value or authenticity of your jewelry for estate and tax purposes, divorce settlements, donations and loans. Though some merchants may offer you free appraisals with your purchases, it is advisable to have a “second opinion” to confirm the value of your jewelry. An independent appraiser will take the time necessary to write an accurate, in-depth appraisal that will help you avoid paying excessive premiums or underinsuring your jewelry. Frank Bartle Jr. is an independent jewelry appraiser. Therefore his reports are completely unbiased. His only purpose is to provide you with accurate documentation and realistic replacement values. No, You are not covered for loss or damage unless you have your jewelry appraised and scheduled separately. Frank Bartle Jr. will carefully document and photograph your jewelry piece-by-piece so you can have it properly scheduled. 4. What is included in a jewelry appraisal? Each appraisal includes complete laboratory testing of your jewelry and an appraisal report for your records. The report contains such information as 1) the content and weight of precious metals;2) a detailed description of diamonds and gemstones (cut, color, clarity, measurements, proportion and finish); 3) a diagram showing any grade setting inclusions or blemishes; 4) multiple color photographs; 5) the appraised value of your jewelry. 5. How can I be sure my jewelry appraisal is accurate? All laboratory tests are performed by Frank Bartle Jr. using the industries most precise scientific instrumentation. Appraisals are based on current market values derived from a computerized networking system that constantly monitors prices through the industry and compares retail prices. 6. Do I have to leave my jewelry with you to have it appraised? No, Frank Bartle Jr. will gladly appraise your jewelry while you wait with an appointment. Your jewelry need not leave your sight. We also respect your privacy; all appraisals are strictly confidential. 7. Do my diamonds or gemstones have to be removed for an appraisal? No, They do not have to be removed from their setting during an appraisal. All lab tests are perfectly safe and will not damage or alter your jewelry in any way. 8. How much should I expect to pay for an appraisal? A flat fee per item is charged for each appraisal. This fee is based only on the time needed to perform the tests and calculations. Fees are in no way determined by the value of the jewelry. 9. Do I need to make an appointment for an appraisal? 10. I am in the market for a diamond engagement ring. Can you advise me? Yes, because diamonds and gemstones can vary greatly in quality, it is a good idea to talk to an expert before making your purchase. Frank Bartle Jr. has a consultation service to educate you about diamonds and gemstones and show you how to recognize the characteristics that give them their value. This knowledge will help you make an informed decision. We can also determine the fair market value of your purchase, which is recommended after all major jewelry purchases, by performing an appraisal.